Three years ago our office asked “Is 2015 Peak Renter?” We laid out a straightforward case examining the three main underlying drivers for the shift into rentership over the previous decade: household finances, demographics, and preferences and tastes. The question was not whether the pendulum would swing back toward ownership, it definitely would, but rather when would it would begin to swing back. Overall that piece got a lot of attention. Bill McBride of Calculated Risk even talked about it on one of his Bloomberg TV appearances! But I also think it is fair to say the work was also greeted with a healthy amount of skepticism at the time. Weren’t we destined to be a nation of renters forever? 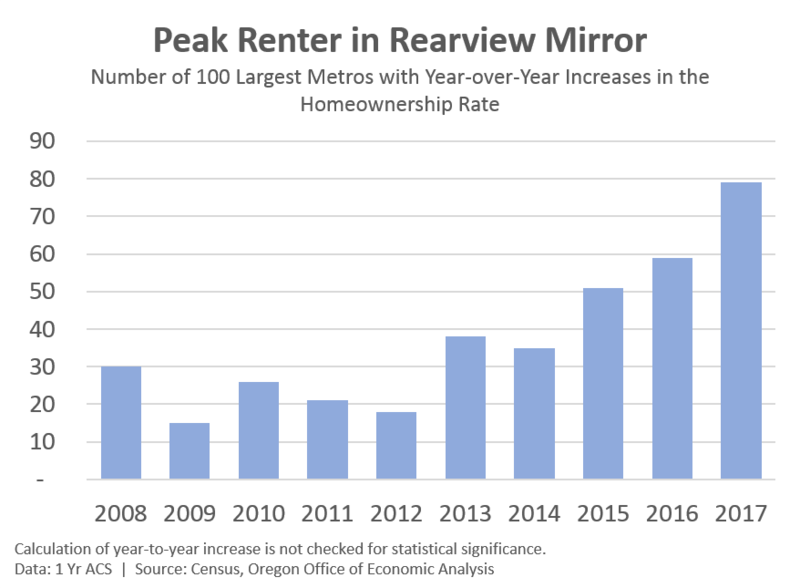 Of course over the past couple of years ownership has rebounded nationwide and depending upon the data set you look at, Peak Renter occurred in 2015 or 2016. Furthermore, these gains are not concentrated in one particular region or another, but are spread across much of the country. Among the 100 largest metro areas, 79 of them saw ownership rates increase last year. There has been a steady increase in the number of large metros with rising ownership rates as seen below. Here in Oregon ownership rates are increasing in the Bend, Eugene, Medford, Portland, and Salem metro areas. 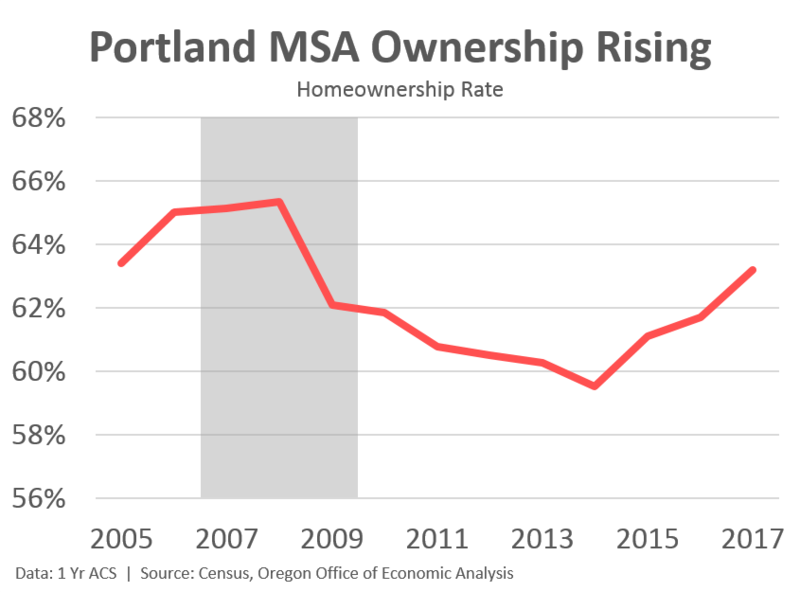 Additionally, the Albany, Corvallis, and Grants Pass MSAs have seen ownership rates stabilize in recent years if you look through the year-to-year noise. That said, the largest ownership rebound in Oregon is happening in the Portland region. Ownership rates bottomed in 2014 and are now nearly two-thirds of the way back to where they were prior to the bubble bursting and foreclosure crisis. Maybe somewhat surprisingly, this strong rebound in ownership is concentrated among the younger households — the region’s 20- and 30-somethings. As discussed last week, this increase is driven by young, married-couple families. Now, Portland does not have especially high ownership rates. 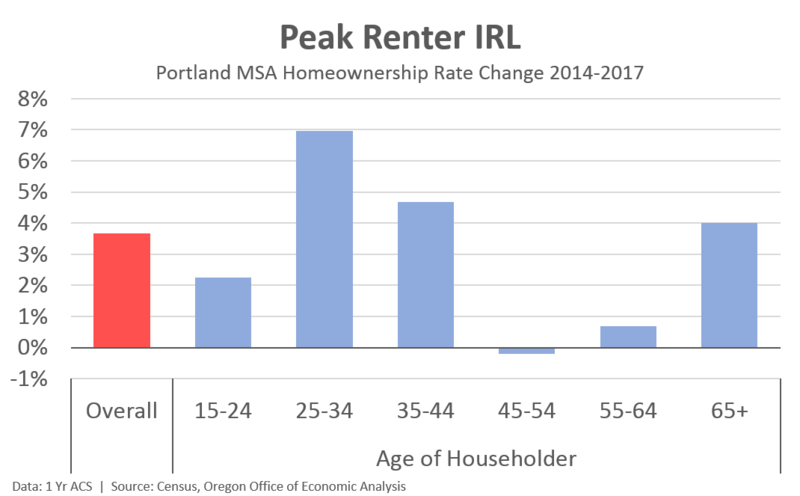 Among 25-34 year olds, Portland homeownership rate ranks 68th highest among the 100 largest metros in 2017. That said, this increase in recent years is the second largest among these same regions. The big homeownership question was not whether Millennials would buy more homes as they aged, be it detached single family, townhomes, or condos. But whether or not they would do so at a faster or slower pace than life cycle trends suggested. Remember, even in recent years, by the time you are in your mid-30s, the population is 50/50 in terms of owners and renters. Well, it turns out to be a little of both. Millennials are living on their own, getting married, and buying homes at a slower pace or at a later age than previous generations, but the ownership rate itself is rebounding faster than expected at the same time. It’s competing long-run and short-run impacts coming to a head, if that makes sense. Finally, during and after the foreclosure crisis, single family rentals increased as investors snapped up properties at bargain prices. There was a lot of discussion about whether or not this was a good development and what it meant for the housing market. 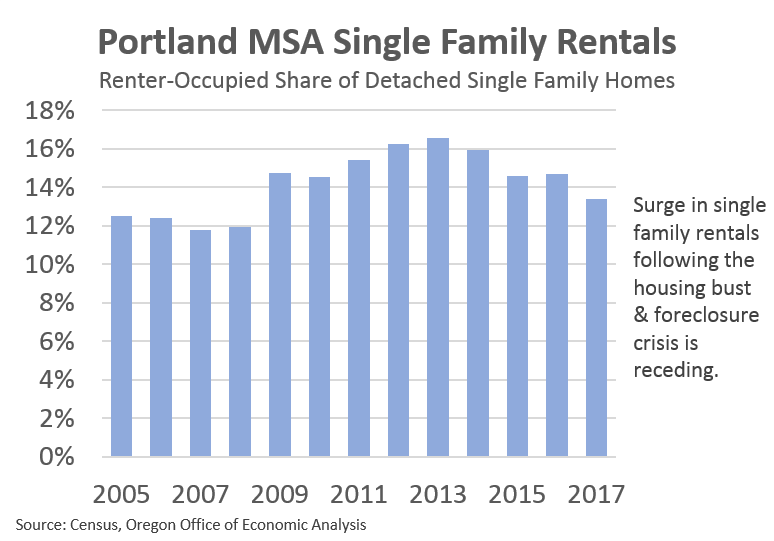 What’s interesting in recent years, however, is that single family rentals in the Portland region, and across the country, are declining. Investors and landlords are selling their properties as prices have rebounded, pocketing a big increase in home equity along the way. This added wrinkle means we are seeing a shift in the types of rental properties in the region. The number of apartments continues to increase with new construction, but the overall rental market has expanded less given this decline in single family rentals. Conversely, the ownership market has expanded a bit more than the new construction numbers indicate as more homes are being converted (reconverted?) from rentals into ownership product. This impact is not small. We have seen around 10,000 fewer single family rentals in recent years. This is equivalent to 1-2 years of new apartment, or new single family supply! This shift under the surface of the overall market helps make sense of the new construction figures. It is not just about new residents, or newly formed households moving into the new apartments, but also about reallocation of existing households across or between product types. Bottom Line: Homeownership is increasing in recent years. Given the ongoing economic expansion, and demographics, the total number of homeowners will certainly increase, while ownership rates are likely to as well, or at least hold steady. Some housing economists are particularly bullish on the 2020s when the Millennials will be in their 30s and 40s, or at ages when most households own. That said, today’s younger households are buying homes a bit less than previous generations at the same age. There is a generational effect influencing the housing market both from an ownership perspective and a type of housing, or the location of housing wanted as well. There are a lot of levers here to pull that can adjust to meet the needs of a growing population. 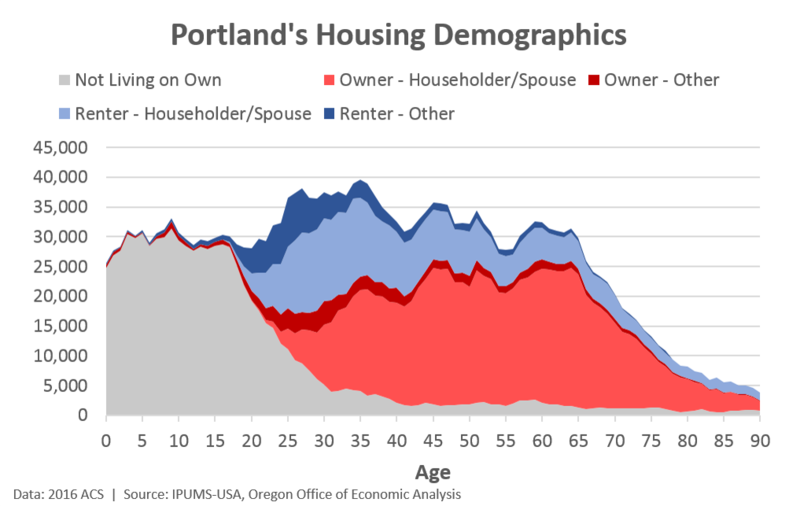 Here in Oregon, we will see an increase in both owner and renter households due to population growth. The key is to continue to add new supply across a range of product types to ensure availability, and help with affordability.